Sparco Multi-Purpose White Copy Paper - Multipurpose copy paper is three-hole punched for quick insertion into presentation binders and works well in high-speed copiers and laser printers. 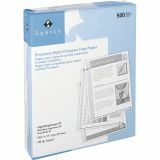 Highest quality, acid-free paper offers a 20 lb. paper weight.